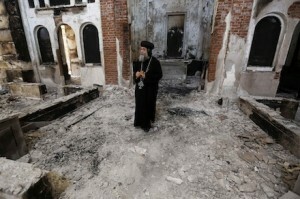 The Coptic Orthodox Church has condemned the killing of seven Egyptian Christians in neighbouring Libya. “We demand the arrest of the terrorist elements behind this painful attack,” the Church said in a statement released yesterday. Egypt’s other local media, meanwhile, displayed gruesome photos of the seven dead, who were reportedly shot by armed militants in eastern Libya. The Egyptians were found with their hands tied behind their backs and bullet holes in their heads, local news media reported, adding that the men’s bodies were scheduled to be flown back to Egypt. Hours earlier, an Egyptian Foreign Ministry spokesman said the killings had taken place late on Sunday in a village on the outskirts of Benghazi, in eastern Libya. Tens of thousands of Egyptians work doing mostly manual labour in Libya, a Muslim nation bordering Egypt in North Africa. The majority of Egypt’s estimated 90 million people are Muslim. Christians make up about 10 per cent of the population.